I’ve noticed lately that mortgage rates are lower on jumbo loans vs. non-jumbos? Is this because the Fed is going to stop buying mortgages backed by Fannie Mae and Freddie Mac? Pretty much – as investor demand for conforming mortgages decreases (thanks in part to Fed exit), interest rates will need to rise to lure in more buyers. Conversely, as more investors seek jumbo loans, rates should drop. I recently applied for a jumbo loan and was told it would be cheaper if it were conforming. So I guess it depends on the lender. I might be able to bring in some cash to keep it under the jumbo limit though. Gotta do the math to see if that makes sense. Yeah, last I checked, Wells Fargo was offering lower rates on jumbo loans than conforming loans, but it might be short-lived, assuming things normalize again soon. I’ve seen the opposite. It depends which bank you’re dealing with and what they specialize in. Most of the time jumbo loans will be priced higher than conforming loans. That’s the norm, so anything opposite of that is the exception, not the rule. Yep. 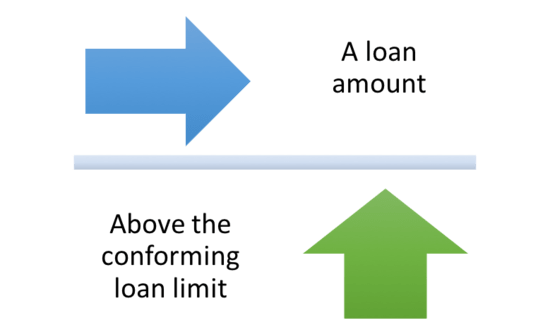 More often than not your jumbo loan is going to price higher than a conforming loan. There’s less liquidity for jumbos on the secondary market, so they often carry a premium.